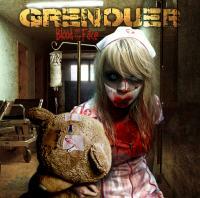 The seventh brand new album from GRENOUER has got the striking title "Blood on the Face". The CD comprised of 11 full songs (including STONE TEMPLE PILOTS cover) is scheduled for release on May 3, 2013 in Europe and July 9, 2013 in North America through legendary Mausoleum Records, the part of Music Avenue Group of Labels. Denis 'Danny' Stepanov is a new permanent band member now! His great talent, experience, passion for drums, common interest in the music and friendship firmly hook him up with GRENOUER, encouraging fresh dynamics! GRENOUER is proud to announce that guitarist Alexander 'Motor' has become the first official endorser from Russia for TAURUS AMP, designers and developers of revolutionary stomp-heads, joining artists AL DI MEOLA, WES BORLAND, PETER CETERA, MICHAEL THOMPSON, etc. and bands PERIPHERY, ANNIHILATOR, THE DILLINGER ESCAPE PLAN!